Hells Gate Hot Rods was born through two things. First, our love for traditional hot rodding and because of how difficult it can be to find the high-quality hot rod parts that you want. After having no luck trying to find flanges to build custom headers for a Buick Nailhead, we decided it was time to make them ourselves. We knew that plenty of do-it-yourself hot rodders were having similar issues, so we started a company that would manufacture less-common header flanges for hot rod enthusiasts like us. Over time, our product line has grown to many other products outside of exhaust flanges and header parts. We strive to reliably carry our full line of hard-to-find parts, which allows our fellow hot rodders to spend their time building and enjoying their projects instead of searching for parts. Hells Gate Hot Rods proudly carries a wide range of high quality, reasonably priced hot rod parts for custom hot rods, rat rods, street rods and race cars that are typically built from scratch or heavily modified existing vehicles. Bomber Style Seats: If you are planning to take your hot rod out on the road, make sure you do it with style and comfort. These seats look similar to the traditional bomber seat style, but come with a nicer 2” thick upholstery foam padding for some comfort. They are available in red, white and black vinyl that has vertical pleats. We also sell all the parts if you want to build your own and accessories including the risers and sliders. Chassis: We produce an air ride chassis compatible with the 1928-1931 Ford Model A. It comes fully air bagged and mandrel bent frame rails. That way, you’ll get improved suspension geometry and ride quality. This is a unique design was designed and engineered by us and is also built right here in our shop. You’ll have endless options to customize this exactly the way you want because body mounts, motor mounts and transmission mounts are not welded on the chassis. However, they are available to add on if you choose. 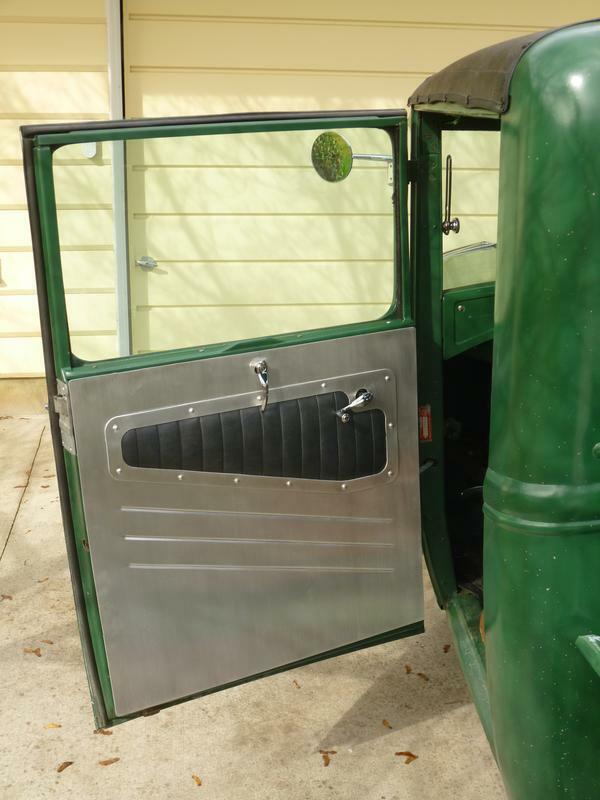 Door panels: Our door panels are a perfect match for our bomber style seats and are compatible with all common models of the 1928-1931 Ford Model A. They are built out of aluminum and hand riveted together. Choose from red, white and black vinyl with vertical pleats. Drill guide: Do you need to drill out your axle and drums to a different bolt pattern? Then check out this drill guide. Using this product can let you have the wheels you want without having to get new axles and brakes. We have 13 different lug combinations for you to choose from. These meet the majority of patterns people need but if you are looking for something different, give us a call. We will likely be able to make you a custom drill guide. Carburetors: Looking for a genuine Stromberg 97 carburetor? Then you’ve come to the right place. We have the original design/style carburetor now combined with new technology and parts. Win-win. Choose from a variety of styles — from chrome to painted to a “barn find” look. Don’t be tempted by the cheap knock-offs that leak and are poorly manufactured, we only carry the genuine Stromberg 97 line. Motor mounts: Hells Gate Hot Rods manufactures motor mounts for all Buick Nailhead engines. Our parts are cut with a high definition plasma cutter using 3/16” P&O steel. All rubber mounts and necessary hardware are included. Valve covers: We have cast aluminum valve covers for several popular engines, including the Buick Nailhead. They are sand cast and unfinished but have options for polished or powder coated black. All these valve covers are cast right here in the US. Header kits (U-Weld): We offer more than 40 different straight and swept lake header kits for any of our header flanges offered. These include Buick, Cadillac, Chevrolet, Chrysler, Dodge, Ford, Mopar, Oldsmobile, Studebaker and Pontiac. Lake header accessories: You want accessories? We’ve got accessories. Our product line includes a variety of dump tubes, turnouts, lake header caps and block offs. Our parts are designed for functionality and with some unique features. For example, making turnouts from mandrel bends to create a uniform bend rather than kinked standard exhaust tubing. Megaphones, transitions & collectors: We sell individual collectors and megaphones as well. You have several options to choose from such as: 4 to 1 formed merge collectors (with or without flanges) and lake header megaphones that are made from the thickest steel (18 ga) on the market. Flanges: Hells Gate Hot Rods has an extensive selection of flanges to choose from in our hot rod parts product line. Here’s a brief look at them: One, two and four-barrel carburetor flanges, 3-bolt collector flanges to pair with merge collectors, more than 50 different exhaust/header flanges suitable for use with all major vehicle manufacturers, 13 varieties of intake flanges (we make these from steel), one-piece exhaust/intake flanges for a select number of inline engines and turbo flanges that are all cut from P&O steel with a high definition plasma cutter. Full-welded intakes: We build and fully TIG weld intakes that work with Stromberg or Rochester style 2 barrel carburetors. We have a variety combinations that are compatible with Chrysler, Desoto and Dodge Hemi, Cadillac and Buick Nailhead. Intake kits (U-weld): Want to save some cash and build your intake yourself? Check out the intake kits that come in single or dual plenum design using a range of two to eight carburetors. They include the intake flanges, carb base flanges and all tubing/parts required to build the intake. All cutting, fitting, and welding to be done by customer for that unique and custom fit intake for your project. Mandrel bends: These are made to our specification with cold-rolled steel tubing. They are perfect for building custom headers, intakes and more. We offer several different angles and sizes to meet your needs and custom application. Not only does Hells Gate Hot Rods carry hard-to-find custom hot rod parts, but we also offer our services to include: engineering, design, and manufacturing of custom parts; part fabrication; private label manufacturing, TIG and MIG welding; and hot rod and custom car building. If you need some custom work done, check out some of our current projects and contact us. Hells Gate Hot Rods provides service that you won’t find anywhere else for your hot rod parts. Don’t just take our word for it. Take a look at our reviews page and some of the projects our customers have been working on and what they say about our products.